Is Your Next Talk Already Boring? Testimonies are powerful because of their narrative structure. They have a flow to them that most talks, which are not based directly on human experience, simply do not have. And yes, most talks that you will hear (and maybe give) do not seem to bother with even a basic beginning, middle, or end narrative flow. That is to say, most talks are usually a list of main ideas, coupled with supporting details, that have no sense of an overall, unified message. They are a mere grouping of individual, isolated elements connected to a topic. Some speakers, or certain occasions, may be fitting to use this approach. But, for the rest of the time, we evangelists and catechists should use testimonies, stories, and a simple narrative structure applied to the whole talk to help create the sense of drama, of meaning, and of flow. The new and corrected translation of the Roman Missal is coming at Advent to a parish near you. This means that the changes in wording, call and response, will be a difficult and lengthy process of adjustment. There are already a bunch of people who are angry that it is even happening at all. Catholic publications and secular press alike have expressed reservations or have outright attacked the new translation and warned against its widespread use. I think such concerns are way overblown in every way except one. This could actually be a smooth transition, a teachable moment, and a great source of renewal in the English speaking world were it not for that one thing that concerns me. 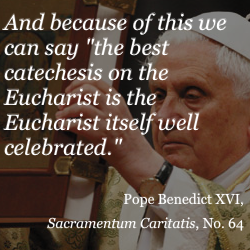 I just don't think the Catholic Church in America is all that great with liturgical catechesis.